Now let us try to reconcile a classic dilemma for people interested in JFK’s assassination: how to make sense of conflicting scientific evidence. On the one hand, we have the credible, plain-spoken, first hand observations of Dr. Robert McClelland, who says President Kennedy was fatally wounded by gunfire from at least two gunmen. On the other hand, we have two panels of medical experts both of which concluded Kennedy was killed by a bullet from behind. Not only do those two claims contradict each other, but there is further problem within the “bullet from behind” theory: the two expert panels disagreed sharply about where the fatal bullet struck. What’s a reasonable person to think? In a new article for Max Holland’s Washington Decoded, John Canal, a retired U.S. Air Force master sergeant, seeks to bolster the “bullet from behind” theory by reconciling the contradictions between the two groups of experts. For defenders of the official theory that one man alone killed Kennedy, the problem of the location of JFK’s head wound is not a small one. The autopsy doctors who examined JFK’s body on the night of November 23, 1963 concluded the fatal shot had struck Kennedy from behind in the middle rear of his head. But a panel of doctors convened by Attorney General Ramsey Clark in 1968 concluded that X-rays revealed the entry to be as high as the area of the president’s cowlick, or almost four inches (or ten centimeters) higher than the location established back in November 1963. The conflicting conclusions have long undermined the “bullet from behind theory” — and thus the theory of a lone gunman — by indicating that seemingly objective and scientific conclusions about the location and direction of the wound are actually subjective matters of interpretation. Canal, author of “Silencing the Lone Assassin: The Murders of JFK and Lee Harvey Oswald,” argues that one of the key autopsy photographs relied on by the Clark Panel was taken after morticians had reconstructed JFK’s scalp for purposes of appearances. This led the panel to mislocate the wound. On first reading, Canal’s analysis raised as many questions for me as it resolved. So I won’t try to pass judgment now. I will limit myself to a couple of observations. Canal acknowledges Dr.McClelland as a qualified eyewitness. “McClelland’s description [of JFK’s head wound] was one of the more precise eyewitness accounts,” he writes. Canal dismisses claims that the autopsy photos are fakes as “unsubstantiated,” which I think is accurate. Canal does not address the possibility that the results of the autopsy have been manipulated, as documented by Doug Horne, formerly of the Assassination Records Review Board (ARRB). He does not mention the sworn testimony of medical technicians, given to the ARRB and available here, that photographs they took at JFK’s autopsy are not included in the National Archives JFK autopsy photo collection. Canal dismisses as “unsubstantiated” the notion that Kennedy’s wounds were altered before the autopsy. Here, I think, Canal is mistaken. There is credible evidence of alteration. For example, FBI agents Francis O’Neill and James Sibert wrote in their report on the autopsy that as soon as JFK’s body was laid on the autopsy table, “It was apparent that a tracheotomy had been performed, as well as surgery of the head area, namely in the top of the skull.” In a sworn deposition for the ARRB, Sibert said that pathologist James Hume was the source for the statement about surgery. Canal’s piece is weaker for not dealing with this issue. I’m interested in what readers with medical training think of McClelland’s account and Canal’s analysis. Meanwhile, Canal concludes with a constructive suggestion. MaryFerrell.org has a good introduction to the JFK Medical Evidence. In light of the recent RFK Jr. comments I have also wondered whether that was possible. It would be interesting to see if the body is actually even in the grave where it is supposed to be. Agreed. The body should be re-exhumed. This is if it’s still there !! I think after 50 years the world should know the truth !! A re-exhumation of the body will finally shed light on the front shot. I think everyone knows JFK was also shot from the front !! The Z film proves that beyond any reasonable doubt. This would lead to a double conspiracy: at least 2 gunmen + the cover-up of the Warren Commission !! For what it’s worth from a non-expert point of view: how can you have an analysis when ALL of the available evidence is in question. Perhaps a more profitable approach would be to submit the available evidence to an unbiased (is this possible?) panel of experts to make a determination as to the authenticity and admissibility of this evidence. Even then, is the evidence complete enough and clear enough to make a determination as to the number and direction of the shots? In my estimation, probably not. Solution? Exhumation… and that’s not going to happen. It is difficult reading but Harold Weisberg broke down much of the deception around the autopsy in his book “Never Again.” For example- an easily audited discrepency between the autopsy report and what is published as “copies” of the notes taken during the autopsy. Something like only 17 out of 85 factual statements in the autopsy report have a corresponding fact in the notes. So where did all these other details of the auopsy come from? Did the doctors remember all these precise measurements, etc.? Were there other notes that still have not been published? Were they fictions? Weisberg broke it down but this is the real research that most don’t have time for. If forensic pathologists do their work properly to try to determine direction/cause of death etc. for a body, how much manipulation can they legally do to that body? In other words, I suppose cutting or sawing the skull open, opening a wound to trace the path of a bullet, etc. would be things necessary I would guess in the JFK autopsy, but if they take the skull wound and break open a much larger part of the skull to make an entry wound look more like an exit wound, etc.—-is this legal? Could it be construed as probing a wound—or is such damage considered illegal tampering of evidence? We know that the limousine was cleaned up and refitted before it could be fully examined as a crime scene, and that other evidence was mishandled, but to do this to Kennedy’s body seems outright bizarre and pretty evil, if that was indeed done. I’d like an expert’s observations on the autopsy rules. No you can’t break open the skull to make a larger exit wound- even if they had directed everybody in the room to face the opposite wall you can’t make a fake head wound as you describe. Wound evaluations entail much more that just the gross external appearance of the wound. Beveling, abrasion collars, micro and macro evaluations of wound tracks are used to establish missile trajectories.. In addition, there are characteristic post mortem tissue changes that make the maneuver you suggest impossible. I never said that the autopsy crew made any alterations, pal. I just posed a question and added a speculative point. Could I get an answer from a forensics specialist, rather than from just Photon please? Lisa, what were the lead reports on CBS,NBC,ABC ? For a bonus what trial coverage was interrupted by the UPI bulletin? You have to go to the photographic evidence first. The autopsy evidence has to be consistent with what is seen at the scene of the crime. The Moorman photo clearly shows the back of the head is intact. Frame 337 of the Zapruder film, equally clearly shows that the skull has been pushed back. This is strong visual evidence for two shots to the head. 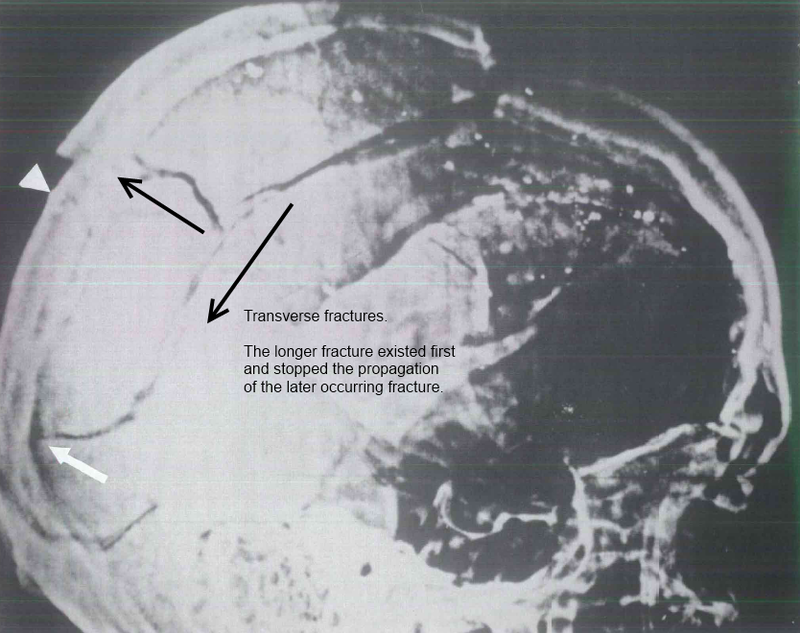 Two shots to the head is also supported by the transverse fracture system seen in the Presidents skull. The photographic evidence is our first look at the wounds to the Presidents head. The autopsy photos have to be interpreted in the context of what we know to have happened from the primary photographic evidence. The President was struck by two , nearly simultaneous , shots to the head. The first shot struck the President from behind at frame 313. The second shot struck from the right at frame 318. This gif animation by Gerda Dunkel is very good. Truly disgusting. But the clearest non-autopsy photo of the head wound that we are likely to get- or should be able to get. It very clearly shows that the head wound is superior and anterior to the right ear. It rather conclusively proves that Dr. McClelland’s perception of the wound position cannot be correct. The occipital portion of the head is clearly visible-and there is no visual evidence of any wound as has been described by posters on this blog for the last 2 weeks. Nope, no visible wound in the occiptal portion of the head, just the very visible “Alterations” done in the precise locations where the wounds should be, as described by medical staff. In no copy of the Zapruder film is there any evidence of an occipital head wound. As I stated previously, of all the Parkland doctors that treated JFK the only ones to publically dissent from the Warren Commission conclusions were Crenshaw and McClelland. I didn’t know Zapruder took the autopsy photographs, that’s news to me. Any films taken of JFK’s head wound the day of the assassination are far too blurred and lacking in detail to make this sort of analysis. To attempt to use the Zapruder film as a citation for critical analysis for head wound locations is laughable at best. Well, you better explain that to Groden and about a dozen other conspiracy authors have done exactly that. I’m not saying directions of shots fired can not be determined in the Zapruder film. Simply that exact locations, or the exact manifestions of damage to JFK’s head caused by the fatal bullet cannot be properly viewed in this film. According to the prosectors, the small entry wound was located at the EOP. Mr. Canal doesn’t ask the obvious question: why didn’t the prosectors order multiple (pre-reconstruction) photos of the EOP wound, including pictures showing the skull with scalp peeled back, perhaps with a probe sticking in the wound? Mr. Canal (correctly) impugns the findings of the Clark Panel’s ‘experts’, suggesting that the Panel was politically motivated. He doesn’t seem to understand that once he acknowledges government corruption, the same conclusion (political chicanery) can be applied to all of the government investigations and inquiries, as well as the autopsy. How legitimate are the ‘facts’ and findings when the ‘experts’ are eager to roll over for the government? Bottom line for Warren Commission die-hards: The Clark Panel (and later, the HSCA) made the government’s official small-rear-entry-wound scenario look like a carnival side show, with numerous ‘experts’ who hadn’t examined the skull making a mockery of the poor, incompetent prosectors who had had the skull in front of them for four hours. The moving head wound has always been an obvious problem and they’re finally inventing an explanation to make it seem sensible. I’d like to address some of the comments of Mr. Morley. Mr. Morley: Canal acknowledges Dr.McClelland as a qualified eyewitness. “McClelland’s description [of JFK’s head wound] was one of the more precise eyewitness accounts,” he writes. Canal: Dr. McClelland is indeed a qualified witness and the evidence supports his account that he saw a large wound in the back of JFK’s head (BOH) through which he saw cerebellum. He also reasoned understandably that the damage there clearly looked like an exit wound, which in turn would be evidence JFK was also shot from the front. The problem with Dr. McClelland’s conclusion, however, is that he was unable to examine the skull with the scalp reflected or the brain. If he had been present during the autopsy he would have known there was only one beveled in entry wound in the skull, only one beveled out skull wound (which was in a piece of frontal bone skull that arrived late), and only one pathway through the brain, which by no coincidence was consistent with the skull entry and exit. I’m convinced the reason the opening in the BOH was “exit-like” vs. a small entry approximately the size of the bullet’s diameter is because the nose of the bullet deformed when it struck the BOH and deflected upwards (approximately 23 degrees) as it penetrated the rear skull. This would have caused a tremendous force to the rear skull upwards and somewhat to the rear, and because of the complete fractures that radiated from the small entry hole, this force caused some of the skull fragments just to become dislodged (while still being adhered to the scalp (which was torn, probably by the sharp edges of one or two of those dislodged bone pieces). Brain matter, including cerebellum, could be seen through the torn scalp and spaces between the dislodged bone pieces. The bottom line is that the BOH wound certainly appeared to be an exit wound but the autopsy proved it wasn’t. Mr. Morley: Canal does not address the possibility that the results of the autopsy have been manipulated, as documented by Doug Horne, formerly of the Assassination Records Review Board (ARRB). Canal: If you call including pictures of the repaired BOH in with the photographic documentation of the actual autopsy as minipulating the autopsy, I’d have to agree with Horne. Morley: He does not mention the sworn testimony of medical technicians, given to the ARRB and available here, that photographs they took at JFK’s autopsy are not included in the National Archives JFK autopsy photo collection. Canal: It’s possible some are missing…what about pictures of the BOH when the body was first received? Maybe some were taken and disposed of? Note, however, he prosectors signed off on the 1966 and 1967 review of the autopsy photos and X-rays in the archives as being complete. That being said, the question is begged, “Would additional pictures have proved another shooter?” Frankly, I don’t see how. The autopsy determined there was only one bullet track through the brain and only one bullet track through his upper back/neck. Morley: Canal dismisses as “unsubstantiated” the notion that Kennedy’s wounds were altered before the autopsy. Here, I think, Canal is mistaken. There is credible evidence of alteration. For example, FBI agents Francis O’Neill and James Sibert wrote in their report on the autopsy that as soon as JFK’s body was laid on the autopsy table, ”It was apparent that a tracheotomy had been performed, as well as surgery of the head area, namely in the top of the skull.” In a sworn deposition for the ARRB, Sibert said that pathologist James Hume was the source for the statement about surgery. Canal’s piece is weaker for not dealing with this issue. Canal: As a practical matter, every single issue could not be addressed in the article…the article focused on arguably the two most significant conflicts. Morley: Humes also told the FBI agents that he thought either the bullet that entered JFK’s upper back either popped out or that it was an “ice bullet”. The FBI took both ridiculous issues seriously. Siebert also stated that he believed pictures of the BOH were taken after they left. As far as surgery prior to the autopsy goes, if Humes had been convinced there had been some done wouldn’t he have mentioned it during any of his testimonies or in the autopsy report? Note that evidently at Parkland gauze packs were placed into the head wound……perhaps it appeared to Humes that “something” was done to treat the head wound at Parkland? But, again, if he was certain there had been surgery performed, I think Humes would have reported it. The bottom line on this IMO is that there is no hard evidence to substantiate the notion that surgery was performed on JFK’s prior to the autopsy. Morley: I’m interested in what readers with medical training think of McClelland’s account and Canal’s analysis. First, any conclusions, by any committee, based upon currently available JFK autopsy images are not accurate, not can they be since the images have been altered. The evidence does exist, even if Canal is unaware of that fact. Canal is on the right track, but only in part. There should indeed be a “re-examination” of the Autopsy images, but not by forensics experts. As already mentioned, examining altered images will not arrive at an accurate accessment. The “re-examination” should be done by a combination of “Computer Graphics” experts and “Photographic” experts, to identify each and every alteration (technology has come a long way since 63). Only if you can prove beyond doubt that these images haven’t been altered can any true assessment be made. But the images have been altered, so where does that leave us? First we must identify and come to terms with that “fact”. The rubber applied to the back of JFK’s neck is also visible in autopsy images. So yes, the body was also altered. Having worked and been trained in emergency medical services, I would expect Dr. McClelland to be alert to his surroundings and what is taking place in ER, especially if it were his responsibility to assist in any way. But even if he only stood by, he would hear what is being discussed, and he would also likely be making visual observations when possible, it’s just common practice to be alert to the situation. Dr. McClelland also was experienced, it wasn’t as if he had just started his first day on the job. —curious about this, I know I have sent to you images detailing some of the alterations to the Bethesda JFK autopsy images. I’ll be happy to send you more if needed. Or simply view them here…. Lastly, it was reported that the back wound did NOT penetrate the body, meaning it did not pass fully through the body. People conveniently ignore this information. But this distinction certainly would settle the matter once and for all, because if the back bullet didn’t exit the body, it would be a little difficult for Lone Nutters to explain the throat wound as an “exit wound”. Well actually, that would be basically impossible wouldn’t it? Any analytical conclusion must also match “all” of the available evidence, be it film, photograph, audial, or verbal testimony. you don’t get to choose “selective” evidence. Shadow boxing may be stimulating, but it accomplishes little or nothing. There is no substance to a shadow. And trying to hit a shadow is what one is doing when they attempt to draw substantive and conclusive information from the photographs, xrays, diagrams, measurements, reports, etc. that were produced by the fraudulent, misbegotten and criminal post-mortem performed on the body of JFK. The only reliable and legitimate evidence is that of the eyewitnesses like Crenshaw and McClelland who saw JFK’s body prior to the so-called autopsy. Gary, you really are not qualified to judge whether an autopsy is criminal, fraudulent or misbegotten. The claim that the only reliable and legitimate evidence is that of the witnesses like Crenshaw and McClelland directly contradicts the medico-legal standards that have driven forensic science for hundreds of years. It is precisely because eye witness medical testimony is often inaccurate and subject to revision that the autopsy is the final legal and medical source of truth, for natural and unnatural death. Ask any doctor who the smartest doctors are- most will answer pathologists. They know everything about everything, but too late. Unfortunately many posters on this blog have a difficulty accepting the concept that eyewitness medical personnel can be wrong, particularly in a stressful situation with incomplete physical exams. Photon, I am very qualified to spot an autopsy report that is fraught with error, inaccuracy and insufficiency. Anyone who makes an intelligent and intellectually honest study of the records of JFK’s post-mortem examination will come to the same conclusion. Even the HSCA — who so despicably lied about the Parkland witnesses — had to admit to that fact. Photon, where do you get off telling Gary he’s “not qualified”? What are YOUR credentials? Since you won’t put them up for the record, I’ll have to assume you are spouting off where you clearly don’t have any expertise. As for me, I’ll listen to other experts who have dug up new information about the case, such as Gary Aguilar, MD, and Kathy Cunningham, who have done an excellent job of pointing out the deficiencies in the Bethesda autopsy done on President Kennedy. Unfortunately, JFK’s autopsy was performed at Bethesda Naval Hospital, a hospital inexperienced in “unnatural death” autopsies, like JFK’s. [JFK’s physician, Admiral George Burkley, advised Jackie that it would be best if the autopsy were performed at “a military hospital for security reasons,” and so she chose the Naval Hospital because of JFK’s prior Navy service. The surgeon in charge was an anatomic pathologist, Navy Commander James H. Humes, MD. So was his second in charge, Commander J. Thornton Boswell, MD. Thirty minutes after the autopsy had begun, a properly credentialed, Army forensics pathologist, Colonel Pierre Finck, MD, arrived from the Armed Forces Institute of Pathology to lend a hand. But by that time Humes and Boswell had already removed JFK’s brain, and forensically important evidence may well have been lost. But even Finck wasn’t what the occasion called for. During the previous two years prior to examining JFK, Finck had performed no autopsies. His job at the AFIP was to do armchair reviews of autopsies others had done. Furthermore, his “outsider” Army status, didn’t enhance his position in JFK’s Navy morgue. So three INADEQUATELY PREPARED PATHOLOGISTS rolled up their sleeves to unravel the complex mysteries of JFK’s murder. The key to the case was to determine from which direction the bullets had come and whether there was evidence of more than one gunman. If the autopsy had proved shots from different directions, the verdict of conspiracy would have been inevitable. The final conclusions, however, were decidedly against conspiracy. Both of the shots that hit JFK, the pathology report said, had come from a single source – above and behind JFK. But how was that conclusion derived? It is likely that the background information the pathologists were given played a role in their decision-making. Isn’t Dr. Aguilar an ophthalmologist? Having representatives of the government (like Canal and two official investigations) tell us the government isn’t guilty of a cover-up is just like letting OJ Simpson do his own DNA test and conclude on his own guilt or innocence. It’s simply not credible. And I just spent the day looking back at first-day reports of the JFK case, before people realized what needed to be covered up. Six to seven shots were “clearly heard,” said the Dallas Times Herald. Kennedy had a hole in the front of his neck that looked to be an entrance wound, reported the New York Times. Another paper reported a small entry wound in the front of the throat and either a separate wound or an exit wound in the back of his head. But never mind the facts when they get in the way with the theory the government wants to put forth. Within days, the press had all fallen in line. Three shots. Oswald alone. I seem to be late to the party, again. Bottom line: JFK did not receive a proper, competent forensic autopsy. There are some things we can never know because of that. One small example (of many): The wound on the anterior neck should have been completely explored. A complete description of the injuries lying beneath the wound (i.e. what tissues were involved and how) should have been noted and tissue samples from the surrounding organs should have been obtained and analyzed. Because they weren’t we will never know about the true nature of the wound. This also speaks to how the other wounds were evaluated. there is a 6.5 mm fragment around the revised entry area that was never mentioned in the original autopsy. They is no doubt this was placed in order to change the location, one that better lined up the president’s head with the 6th floor window. Sorry moderators if the above statement was directed at me because I mentioned the word treason. But when a 6.5 mm fragment is found in an x ray of a revised location of a bullet location, what other conclusion can there be? This fragment also represents the middle of a bullet – telling us the bullet broke in half inside of the presidents head, and the front continued on to hit the windshield, and dent the frame of the car. The fact that the gov moved the location 4 inches to line up with the 6th floor window is bad enough, but to plant a fragment as well – what else can it be called?